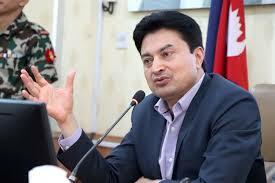 Kathmandu – Minister for Labour, Employment and Social Security, Gokarna Bista, has said the facilities and services of the labourers would be fully implemented in the industrial sector and establishments in accordance with the Labour Act. Addressing an interaction on ‘System of Responsible Business in Federal Policy’ organized by the Association of Community Radio Broadcasters Nepal (ACORAB) here today, he said the existing problems between the employers and the labourers would be resolved through collective negotiations alone. He stressed that the agriculture sector was important in creating employment opportunities within the country and in reducing the burgeoning trade deficit; hence, the need of increasing agricultural production in accordance with the provincial characteristics. Former Minister Haribol Gajurel advocated for a favourable federal policy for increasing agricultural production by providing agricultural inputs to farmers in time. National Assembly member Balaram Baskota emphasized on the need of mechanization of agriculture. Secretary at the Ministry of Agriculture and Livestock Development, Dr Yubakdhoj GC complained that the budget allocated to the Ministry (only two per cent of the total national budget) was insufficient and so it could not carry out training and other programmes targeted to farmers. General Manager of Nepal Agricultural Cooperatives Federation, Rudra Bhattarai said that 942 various cooperative organizations including the small farmers coops across 71 of the 77 districts in the country were affiliated to the Federation.